Byodo-in is a temple located in the Uji city, in south Kyoto. Uji city being a location famous for its production of green tea, there are many green tea specialized shops on the way to Byodo-in. As you are heading towards the temple, you will be asked by the shop clerks: “how about some green tea?”. There are many well known shops that sell sweets made from green tea, like parfait or jelly (the famous Nakamura and Tokichi Itohkyuemon stores are also nearby). Be sure to stop by these stores when visiting Byodo-in! Byodo-in was built by Fujiwara no Yorimichi about 1,000 years ago in the chaotic Heian era for people to pray during those difficult times. The building is currently called Houou-dou (Phoenix Hall), Byodo-in being temple that has the phoenix bird at its core. People started calling it this way because the building looks like a legendary phoenix bird having its wings spread. 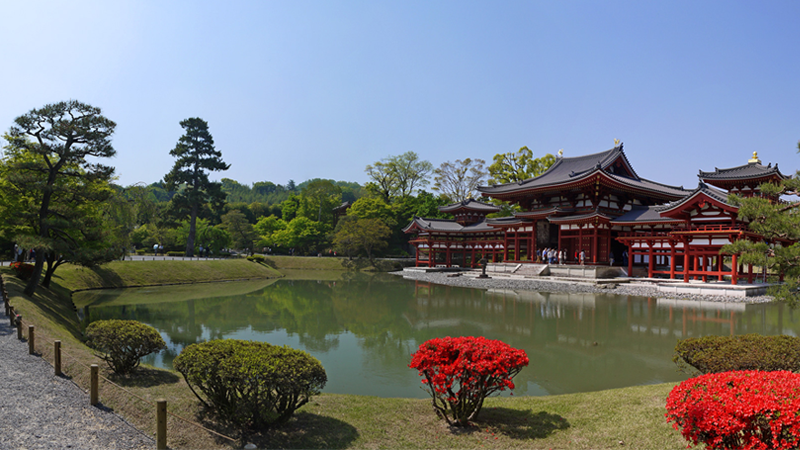 It is considered that the Phoenix Hall is a reflection of Heian era’s culture. The Phoenix Hall underwent many large scale reparations until now. During the big Japan reconstruction it was demolished and reconstructed, having many Japanese style features implemented. You may think it was useless to demolish the building just to construct it again, but the operation plays a major role in understanding the structure of the temple. It is currently known about it being built during the Heian era thanks to the construction plans that remained from back then. Furthermore, modifications were made to the roof and the bridge recently from 2012 to 2014. Since the end of the reparations in 2014’s autumn the temple became one of Kyoto’s most popular attractions, being visited by many Japanese and foreign tourists. During the reparations that took place between 2012 and 2014 the Phoenix Hall’s exterior was changed to a color similar to the one it had during the Heian era. The phoenix bird on the roof was also changed to a golden color. The appearance of the Phoenix Hall is very different from how it looked like before the repair, the exterior being now painted in a deep red color. Even though the colors started to fade a bit now, the Phoenix Hall’s interior looked astonishing when it was built to resemble Paradise. You will surely be captivated by the colors. There are 52 wood carvings called “Unchu Kuyo Bodhisattva” on display on the Hall’s interior wall (half of which are actually replicas of the real carvings, while the real ones are being displayed in the Byodo-in museum). The people in the carvings are showed playing various instruments, dancing or praying, each one of them showing some charming expressions. The Phoenix Hall is surrounded by Aji pond’s waters. The Hall’s silhouette beautifully reflects in the water surface. Let’s find the best angle together and take pictures of the fascinating reflection! The Phoenix Hall together with its reflection on the water will surely make a magical picture! There are also various stones placed between the Hall and the pond which are not just scattered anyhow. They also contribute to the Hall’s beauty. If the stones wouldn’t exist, it would feel like something is missing. The Phoenix Hall is also unusually symmetric for a Japanese traditional building, creating a unique sight. The hallways at the left and right are not accessible because of the ornamental buildings. If you happen to have Japanese money in your wallet, take a JPY10 coin out and observe it well. You will see the Byodo-in Phoenix Hall drawn on the coin. The Phoenix Hall image started being used on the 10 yen coins from 1951. Furthermore, if you also have a JPY10,000 bill you will notice that Byodo-in is drawn on it as well. The Phoenix refers to male and female birds. On the Phoenix Hall’s roof there is, as in the old times, a resurrected golden phoenix bird (a replica). The original phoenix bird is displayed in the temple’s museum. It seems that at in Byodo-in’s case, there is no distinction made between male and female phoenix. There are numerous goods for sale at the museum. For example caricatures of the wood carvings printed on paper, tags, clear files and other kinds of stationery, and other many souvenirs. Take the Tokaido shikansen to Kyoto station. From here, take the JR Nara line to Uji station. The temple is a 10 minute walk from the station. From Kyoto station, take the JR Nara line to Uji station. The temple is a 10 minute walk from the station. Hakone Free Pass To Make Your Hakone Hot Spring Tour More Fun!! A castle you can eat!? The idea is too incredible! What’s the trick to win the hidden battle in Kumamoto Castle? Good place to live in, sights are good, food is good! What sort of place is Fukuoka? What Makes Tenryuji Temple of Kyoto So Heavenly? 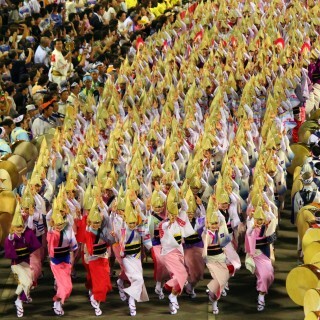 Make sightseeing in Miyajima even more enjoyable! Reviews of popular accommodation in Japan (from modern hotels to traditional inns). BEST 8 !! [ski Japan]Enjoy Rustle Powder Snow in International Niseko! Five Heartbreaking Stories Told By Hiroshima Peace Memorial Park Guide Will Make Your Heart Weep! 2015 One Japan All Rights Reserved.